In January, Pulkinen won the junior men’s event at the 2018 U.S. Championships in San Jose, California, less than one month after winning the silver medal at the ISU Junior Grand Prix Final in Nagoya, Japan. Pulkinen will compete on Thursday and Friday this week (Aug. 30-31) at the second Junior Grand Prix in Linz, Austria. Pulkinen is coached by Tom Zakrajsek and represents the Broadmoor Skating Club in Colorado Springs, Colorado. Before Pulkinen left for Linz, he conversed with Figure Skaters Online. Figure Skaters Online (FSO): If you could define last season in one word, what would it be and why? What were you most proud of last season and what were some of your challenges last season? Camden Pulkinen (CP): In one word, I would describe last season as the word “statement.” I feel like I emerged out of my shell and accomplished many achievements. I had so many break through moments throughout the season. Last season, I was most proud of earning the silver medal at the JGP (Junior Grand Prix) Final. Up until that point, even making the Final was a dream to me. I made the dream a reality and walked away with a medal. Some difficulties that I had last season was delivering a clean short program. I never really had the program put together and failed to deliver it clean all last season. 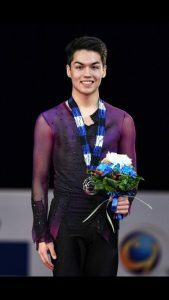 FSO: Besides winning silver at the Junior Grand Prix Final, you also became the Junior National Champion. What was it like to get on top of the podium this year after finishing second the year before? CP: Becoming junior national champion was a dream come true. I had never had a national title, and to win it during an Olympic season was fantastic. In San Jose, I had plenty of pressure to win the event, so living up to the expectation really made me feel good about myself. FSO: You competed in your first Junior Worlds. It didn’t start out the way you hoped with 17th place short program, but you managed to bring it together in the free skate, finishing in 4th place and 6th overall. CP: It was difficult to come short of what I expected in the short program. I had to stay in the moment. I was extremely happy with my long program, although I was just a few points short of getting a junior world medal. It was good that I could deliver a long program that I am capable of, but I am excited to show that I am a more consistent short program skater this season. 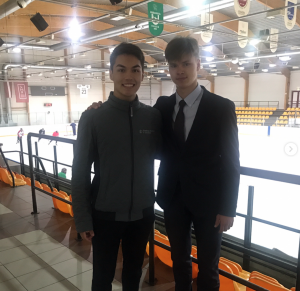 FSO: Moving on to the new season… you spent some time working with two-time World Champion and 2006 Olympic silver medalist Stéphane Lambiel in Latvia this off-season. What kind of choreographer is he? 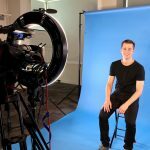 How did it come about working with him and why did you want to work with him? CP: Stéphane is absolutely stunning. He really inspired me to recreate myself as an artist. The kind of choreographer that he is is that he could truly skate to any piece of music and make it seem like the music comes from his soul. I was given this opportunity during the off-season (to work with him) and wanted to work with him because I watched a few videos of him skate and I fell in love with his style and the flair he brought to the ice. FSO: What was it like to train and spend time in Latvia? What was it like to train with three-time Latvian national champion Deniss Vasiljevs and the others there? CP: I was in Daugavpils, Latvia. It was a nice break to go to Europe and actually explore, without having the pressure of international competition on my mind. I made so many new friends, as well as rebuilt connections I had with other skaters. The last time I saw Deniss Vasiljevs was at the 2016 Youth Olympic Games in Lillehammer, Norway. I remember it was my first international and Deniss was a veteran to the international circuit. He was always very nice, and poised himself in a professional, respectable, and proper manner. When I saw Deniss again, those qualities had still existed, but some new ones emerged. He now had more artistry, and brought his own unique style to the ice. Seeing these attributes grow from the past few years made me realize that I could do the same. FSO: Lambiel choreographed your short program. How did you choose your short program music? Can you describe your short program for those who haven’t had a chance to see it yet? CP: It’s a classical tango piece called “Oblivion” by Astor Piazzolla and performed by Lucia Micarelli. I originally wanted to skate to it a few seasons ago, however I knew that I would not be doing the music justice if I skated to this mature piece when I simply did not have the ability to. This year, it was time. I felt like it would be challenging enough, but attainable. I think anybody who watches this program will expect to see zest, dynamic movements, and deep edges! FSO: Tom Dickson choreographed your free skate. What was it like to work with him again? What kind of choreographer is he? CP: Tom is such an experienced choreographer who I have worked with for three seasons now. We now have a connection where he challenges me with difficult movements, and pushes me because he believes in me. He’s the type of choreographer who you need to have an open mind for. Tom Dickson is really good at creating a complete skater, and one with a closed-off mind simply will not match with him. That being said, he is helping me improve weekly on ballet, “street dancing,” and looking aesthetically pleasing. FSO: How did you decide on West Side Story for your free skate and how did you choose the specific pieces? CP: I originally detested West Side Story. Not necessarily because of the fantastic story line or music, but because the music was so overused. One day, I was joking with Tom Dickson about music selections for this year and I teasingly made the comment, “Maybe I should skate to West Side Story.” He turned to me and said “that could work.” I ended up watching the movie again a month later, and I decided that I would skate to it. The famous piece “Maria” hasn’t been used too much in the skating world, so we crafted a mix of selections, being sure not put a unique twist on it. Now, I love my free skate program! FSO: What have been some of your goals on the technical side as well as in program components this off-season? CP: On the technical side, it is, of course, the quad jumps. I want to master all of the quads. However, I know that will take time. Though this season I plan to add a quad, or two, depending on how the training goes on them. Nowadays, skating has become a game of quads, and to compete with the top seniors next season, I will need not one, but multiple quads. On the components side, a huge goal of mine is to skate my West Side Story as if I’m a character from the movie. I think if I can do that this season, it will further help me become an all around skater. FSO: Speaking of quads, we have seen a video of you trying the quad Axel on the harness. Is this a goal of yours? CP: Yes it is a goal of mine. With the quad Axel, it needs to be so near technical perfection, that it may take years. My goal for that jump is not next season, but I want to have landed it by the 2022 Olympic season. FSO: The 2018-2019 ISU Junior Grand Prix Season is upon us. What are your goals for the JGP this season? CP: Being second at the Junior Grand Prix Final last year, my goal for this season is to go to the Junior Grand Prix Final again, and win gold. FSO: You won the gold medal last year at your first JGP in Austria. What are your thoughts about heading back to Austria this year? CP: I am beyond ecstatic. Last year, it was in Salzburg, Austria, and this year it is in Linz, Austria. The Austrian supporters were amazing, and the local organizing committee did a fantastic job with last year’s event, so I’m looking forward to another great event. FSO: You made your senior international debut in 2017 at the Philadelphia Summer International, but you chose to remain on the junior level for the remainder of the season. This season, you competed at the senior level in Philadelphia Summer Invitational again and plan to skate on the senior level at the U.S. Championships. What are your thoughts on making your senior national debut? CP: I am excited to compete Seniors at the U.S. Championships this year. Being Junior champion last year was huge motivation for me, but this year I really want to test my skills against the Senior guys. I want to show that I am a mature senior level skater and that I can compete with the top U.S. guys. 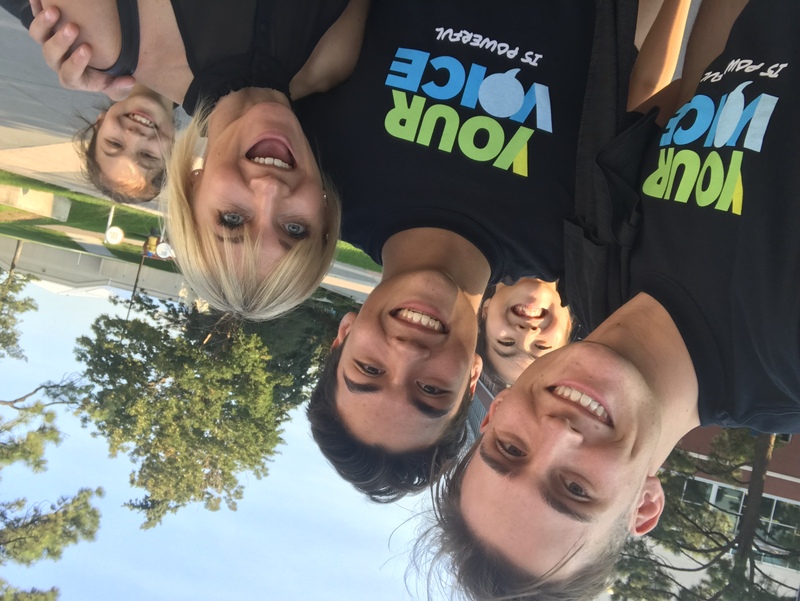 Camden (center) at Champs Camp with TJ Nyman and Aljona Savchenko as Sarah Feng and Alysa Liu (far right) “photobomb” from the rear. FSO: Just last week, you got the chance to go to Champs Camp. What was that experience like? CP: This year for Champs Camp, U.S. 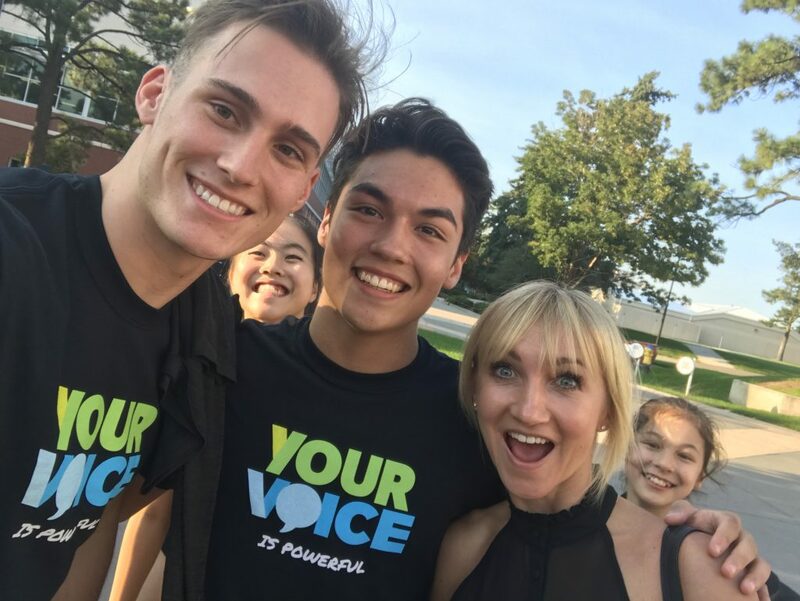 Figure Skating decided to include its top juniors competing this season. It was so unique to be on the ice and skate with the top seniors in the USA. I think anybody watching the practices could say it was intense and had an aura of athleticism in the air. We also had a photo shoot and headshots. It was my first time having these two opportunities and it made me feel so special and official! This experience made me really want to be in the seniors’ Champs Camp next year! FSO: As you mentioned earlier, you had the opportunity to skate at the 2016 Youth Olympic Games. What was that experience like for you? CP: In 2016, I was nominated to the U.S. Youth Olympic Team. It was my first international and I was so spoiled to have gotten that opportunity. Competing there (Lillehammer, Norway) was so much fun. I got the opportunity to watch other sports and hang out with all the different athletes. I created tons of bonds with the athletes from other countries. I think after that experience, I was hungry for more and worked hard to earn a Junior Grand Prix and a national medal. It was a springboard for the success leading up to this point. The opening and closing ceremonies were fantastic with dancing, friends, and a long Olympic walk. It was an experience that made my hunger to become an Olympian even greater! 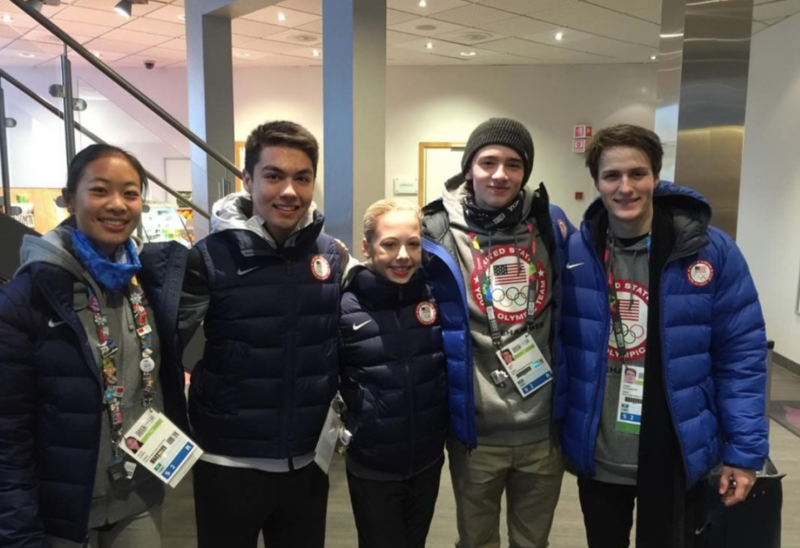 Camden (second from left) with Vanna Giang, Sarah Rose, Logan Bye and Joseph Goodpaster at the 2016 Winter Youth Olympic Games in Norway.